On-going consultation with Inuit and other stakeholders is a critical component of respecting human rights. The concept of Free, Prior and Informed Consent (FPIC) has not been formally recognized in Canadian law or in the corporate policies of Baffinland and its parent companies. However, there is a strong legal framework for consultation with Inuit in Nunavut. Inuit rights have largely been protected to date as a result of the requirements of the Canadian Constitution and the Nunavut Lands Claim Agreement. 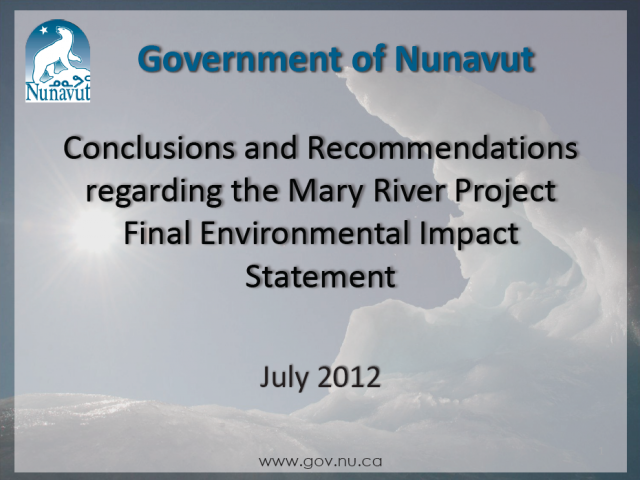 A key component has been the impact review process by the Nunavut Impact Review Board that provided a process for informed discussion and community input. 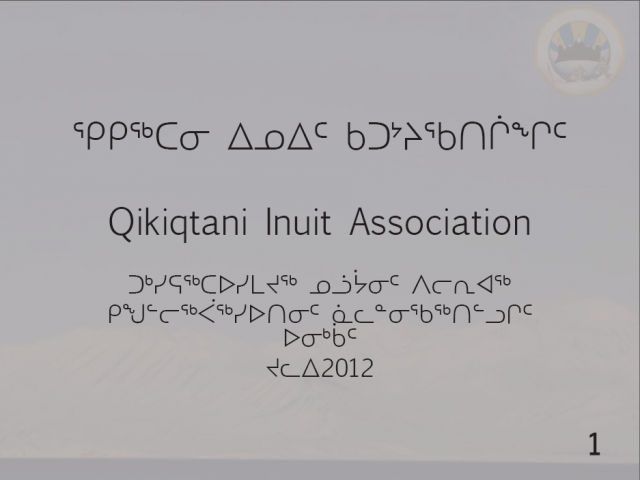 The requirement for Baffinland to negotiate an Inuit Impact Benefit Agreement with the Qikiqtani Inuit Association also provides a process for Inuit to provide their consent about how the mine will be developed. On-going consultation with Inuit and other stakeholders is a critical component of respecting human rights. The concept of Free, Prior and Informed Consent (FPIC) has not been formally recognized in Canadian law or in the corporate policies of Baffinland and its parent companies. However, there is a strong legal framework for consultation with Inuit in Nunavut. Inuit rights have largely been protected to date as a result of the requirements of the Canadian Constitution and the Nunavut Lands Claim Agreement. 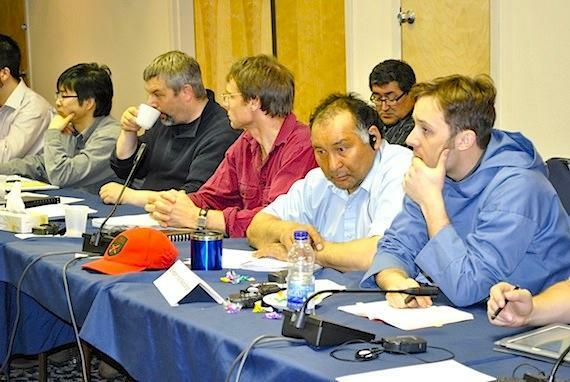 A key component has been the impact review process by the Nunavut Impact Review Board that provided a process for informed discussion and community input. 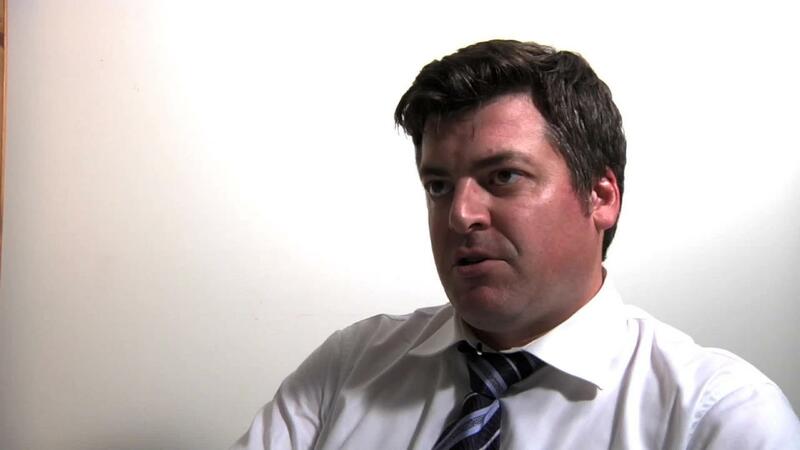 The Baffinland company began its stakeholder engagement in 2006. There have been numerous consultation opportunities as part of the NIRB process that began in 2008 and included public hearings in the summer of 2012. The NIRB has announced new consultations as part of the reconsideration process for the Early Revenue Phase. 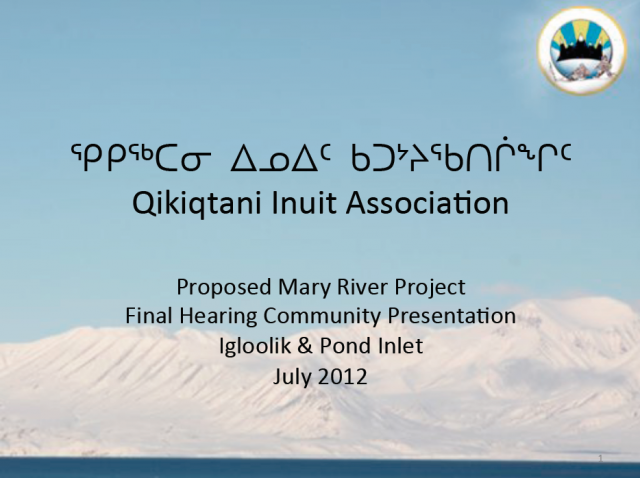 Consultation about the Mary River Mine has included Designated Inuit Organizations and Inuit from affected communities, as well as numerous federal and territorial government departments, other organizations and intervenors with mandates related to supporting Inuit. 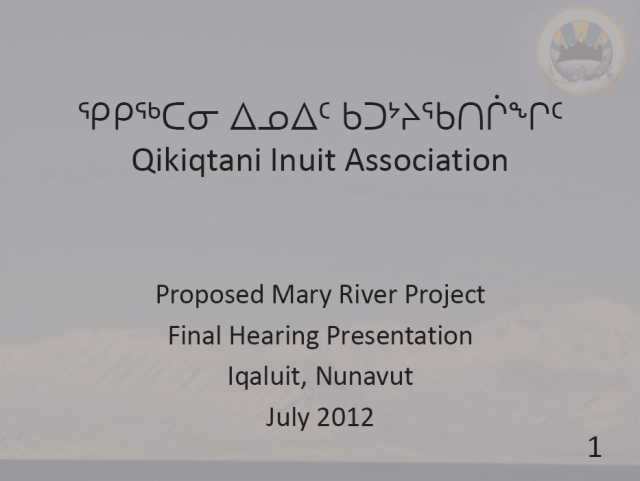 During the public hearings, the Qikiqtani Inuit Association and Nunavut Tunngavik Incorporated expressed support for the Mary River Project, while raising some concerns and providing recommendations to the NIRB. 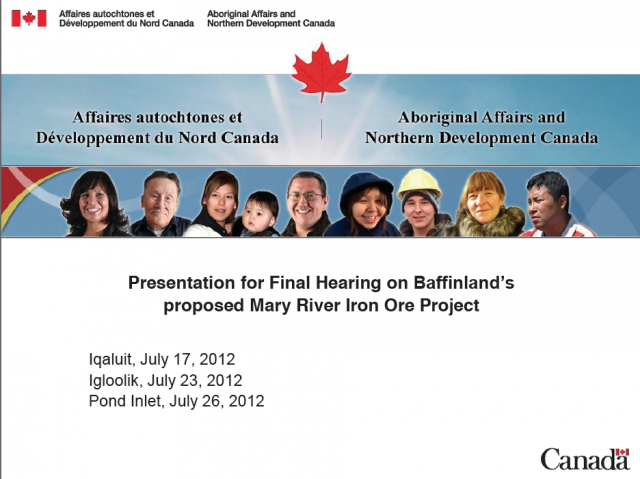 Elders and other Inuk expressed many concerns and expectations about different aspects of the Mary River Mine throughout the public hearings. However, very few of these individuals said that the mine should not go ahead. Most individuals stressed the need for jobs and benefits for Inuit and strong protections for the environment and communities. 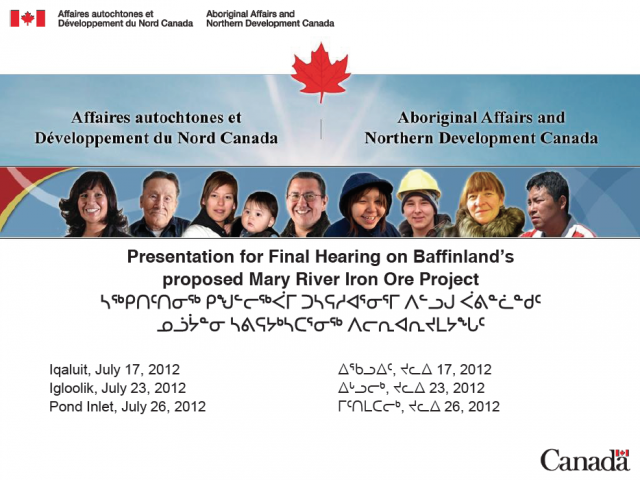 It was important and useful that Inuit participated in the NIRB process. The NIRB Final Hearing Report includes over 180 terms and conditions in response to community concerns and Parties’ recommendations. 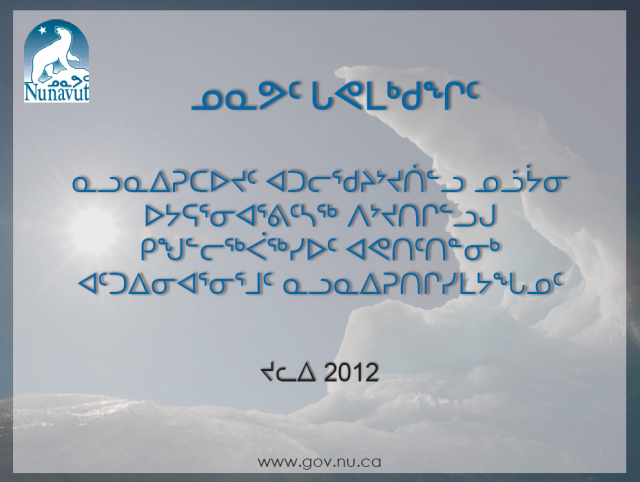 A number of the terms and conditions address on-going consultation with Inuit and other stakeholders. The Minister accepted all these terms and conditions, so there will be on-going mechanisms and processes for consultation with Inuit. Consultation and consent should not be viewed as a “one-time event” in the context of obtaining the project certificate, but rather as a continuous process of building and maintaining trust and respecting the rights of Inuit and other stakeholders. Consultation processes are by their nature complex and imperfect. Their success requires the sustained efforts of many parties over a long period of time. They can always be improved. For instance, the timing of public hearings or consultation meetings during periods when Inuit want to be on the land for traditional activities may hamper full participation. 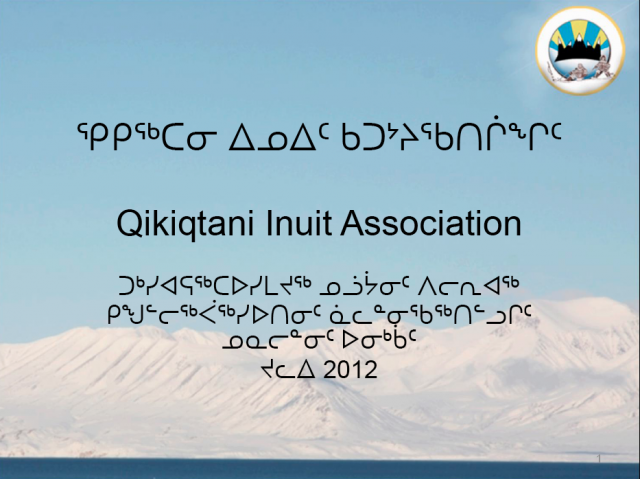 Translation of information about the mine into Inuktitut is important to ensure that all community members understand what is happening, as well as to respect Inuit culture and rights.